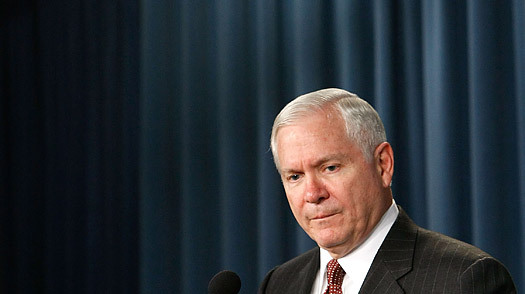 Secretary of Defense Robert Gates will remain in charge of the Pentagon. That lets President-elect Obama fulfill his pledge to include a Republican in his cabinet, although Gates isn't registered as one. Gates has also won wide bipartisan support for his role in restoring comity and common sense to a military establishment polarized and politicized by six years under predecessor Donald Rumsfeld.  Born September 25, 1943, in Wichita, Kansas. He later became a young Air Force officer.  Served for 26 years at the CIA, ending his tenure as chief of the spy agency under President George H. W. Bush, before retiring and becoming head of Texas A&M University.  His CIA career was interrupted from 1967 to 1969 when her served as an Air Force intelligence officer. Gates spent 1974 to 1979 on the National Security Council staff at the White House and served there again from 1989 to 1991.  First nominated to run the CIA in 1987, he withdrew his name after it became clear the Senate would reject him over concerns about his role in the Iran-Contra affair. But he won Senate confirmation on a second try in 1991, becoming the only entry-level CIA officer to end up running the agency. The special counsel investigating the Iran-contra case eventually concluded that Gates' role in the scandal "did not warrant indictment."  As a top CIA official for many years, Gates was criticized for failing to gauge the impending collapse of the Soviet Union.  He was also the first pick to serve as Secretary of the Department of Homeland Security when it was created following the September 11, 2001 Attacks. He declined the appointment to remain President of Texas A&M University.  At the Pentagon, Gates has won accolades for accountability firing senior officers and officials he deemed to have failed the nation's wounded vets and to have been derelict in ensuring the security of America's nuclear weapons.  He has also has pushed hard to dispatch more armor and remote-controlled drones to Afghanistan and Iraq even if it means the services have to pare back their spending on gold-plated weapons such as the Air Force's $350 million-a-copy F-22 fighter.  At the highest levels, officials praise Gates' calm demeanor and interest in their opinions. "He still comes to the tank every week to hear them out," a Pentagon official says of Gates' regular meeting in the Joint Chiefs' secure conference room.  Married, one daughter, one son. "Bob Gates understands that the secret to successful leadership lies in the willingness to accept counsel and advice from many people, both inside and outside of government. When facts and circumstances change or when mistakes are made, we must have a Secretary of Defense who listens, who understands, who corrects errors rapidly, and who adapts to reality."  Former Senator Sam Nunn on what makes Gates a good boss (December 6, 2006). "In my first session with Dr. Gates, I went in and said, 'Sir, I think we need to grow the Marine Corps.' He said, 'I think you're right.' So I put away the brief that I had prepared to convince him and we had a very ecumenical discussion on it."  Marine Commandant James Conway (remarks made to a Washington audience, October 16, 2007). "Cool, calm and collected, this is a man who would never be rattled by a sudden 3 a.m. phone call."  Zbigniew Brzezinski on Gates' temperament (writing up Gates as one of the "Time 100," April 28, 2008). "No sir."  Responding when Senator Carl Levin, chairman of the armed services committee, asked him at Gates' confirmation hearing if the U.S. was winning the war in Iraq (December 5, 2006). "No member of the U.S. military is allowed to do it, period."  Stepping to the podium after Admiral Mike Mullen, chairman of the Joint Chiefs, was vague on whether or not U.S. military personnel could "water board" detainees (Pentagon press conference, November 1, 2007). "I have finally achieved the goal I've been working for for the entire last year. I have brought unity to the alliance, unfortunately not in the right direction."  Speaking of his comments to a reporter criticizing NATO's inadequate training of troops deployed to Afghanistan, which generated a tizzy in European capitals (testifying before the Senate Armed Services Committee, February 6, 2008). "Since October 1979, I've been on a quest for the elusive Iranian moderate, and I haven't found one yet."  Speaking of the futility of negotiating with the government in Tehran (testifying before a Senate Appropriations Committee panel, May 20, 2008). "If you ask me today, after the successes that we've had against al Qaeda in Iraq, where the greatest threat to the (U.S.) homeland lies, I would tell you it's in western Pakistan."  Assessing where the next terror attack on the U.S. would most likely originate (testifying before the Senate Armed Services Committee, September 23, 2008).